Premium law firms in the US are benefitting from a surge in corporate M&A according to a new report. 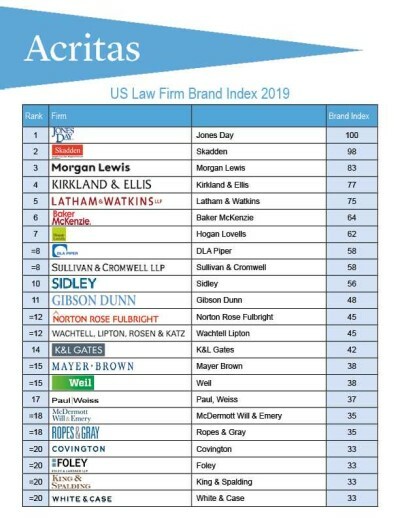 The Acritas 8th annual US Law Firm Brand Index has Jones Day leading the field, in what Acritas says is the most competitive market in the index’s history. Acritas research at the end of 2017 pointed to M&A being a strong driver of increased legal spend in 2018. “Fast forward to 12 months later and we are seeing this increased M&A spend borne out in the brand results, as an increase in M&A brand recognition for firms like Gibson Dunn, Kirkland & Ellis, Paul Weiss, Skadden and Sullivan & Cromwell, has been the greatest contributor to their overall standing in the Index.” said Lizzy Duffy, Vice President of Acritas US. Skadden is snapping at the heels of the three-times-leader with just two points separating the top two. Other firms in the top 10 include Morgan Lewis, Baker McKenzie, Hogan Lovells, and DLA Piper. But Duffy says that some law firms are missing out on the opportunity that is in the market right now. “The US is the most in-demand legal market for foreign multinationals and receives the highest value of inbound legal spend” she said. But among firms with offices in an average of 14 countries, fewer than half of the strongest US brands are making the top list for international clients’ US work. 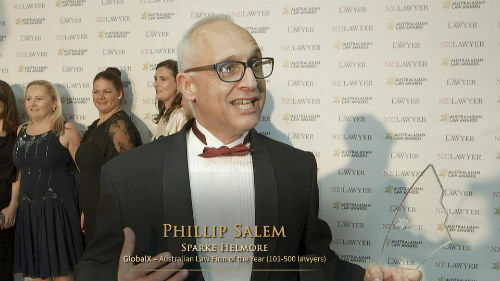 “There is a significant opportunity for US firms to make greater return on their investment in building an international practice, by not only servicing their US clients’ needs overseas but by capitalizing on the strength of their US brand credibility to bring work from clients in local markets back to the firm in the US.” Duffy concluded. Morgan Lewis has deprived rival Squire Patten Boggs of 15 investment management, tax, and corporate lawyers as its bolsters its teams in the US and Middle East. In Abu Dhabi, the firm will open its 31st office worldwide on the 1st of March. It will be home to 21 people including a team of 8 lawyers from Squires, who will be led by partner Bill Nash, who was office managing partner and coordinator of the Middle East/North Africa practice at Squires. Meanwhile, Morgan Lewis has also raided Squires for a 10-person team in Washington, DC, which includes 7 lawyers, led by partner Courtney Nowell. China’s top movie-ticketing app is about to launch on the Hong Kong Stock Exchange with help from Clifford Chance. The law firm has advised Maoyan Entertainment US$250 million IPO and listing with a team led by China co-managing partner Tim Wang along with partners Amy Lo and Fang Liu, consultant Christine Xu and several senior associates and associates.